I think that it is a product for very much without the other maker which is always used. This review is about item#7334065. 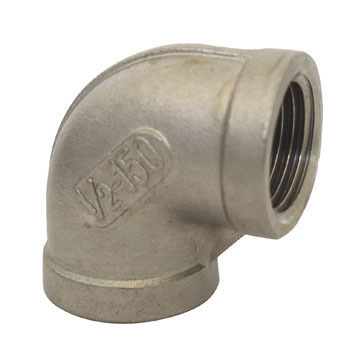 Used for steam and water piping of manufacturing facilities. The precision of the outside molding and screw-in part is firm, and I do not feel the difference compared with the one made by a famous manufacturer. As it is cheap, we use continuously. This review is about item#07334065. The charm is that stainless elbows can be purchased at low prices from one size each. There is no problem with the quality of the home center equivalent, and if it is Monotaro, it will help you not to worry about the setup of the work because it will be delivered immediately as compared to other site purchases. This review is about item#7334047. It is a very good product and there is no point to improve it. This review is about item#7334074. Monotaro brand "parts for stainless steel piping", each of usability is good. There is no problem as long as you want to pipeline normally without worrying about appearance. By the way, we are not specialist of plumbing. This review is about item#37603842. It is cheap and satisfying compared to poly tube elbow, used for entrance of solar water heater, I use quite convenient as rust comes out if it is iron. It used for piping through which high temperature gas passes. Normally iron made is rusty and it is hard to break. Even if it is painted to prevent rust, it gets burned and it rusts immediately. Even with initial cost it is better to make it stainless steel. Even if it is cheap, the monotaro brands are patronizing because there is no quality problem. This review is about item#7334083. I purchased it because it is cheapest among stainless steel products. There was no problem in use such as processing precision. Although it is good with brass or copper at low pressure, I purchased it because it is insecure because it is high pressure air. Especially without burrs and fuzzing, making is polite. I think that it is good. It is saved because the SUS elbow can be obtained at this price. The accuracy of the screw was also no problem.